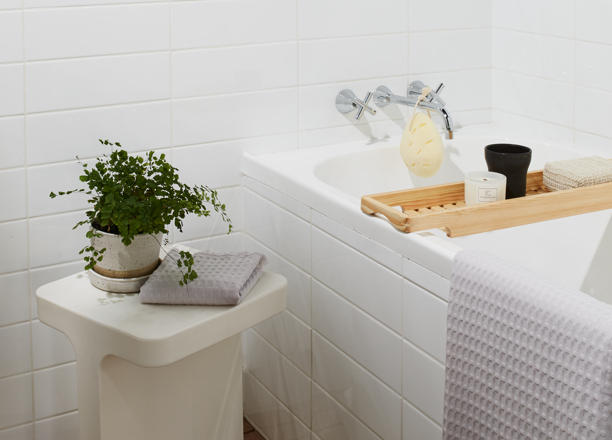 Experience the ultimate comfort and safety in your bathroom space here. There are many styles of toilets designed to accommodate different needs. For example, ‘Easy Height’ toilets have extra height to allow for easy transfer on/off the toilet. Some toilet models also feature arm rests, back rests and raised buttons for easier use. Tapware is one of the most stylish aspects of the modern bathroom, and Care tapware is no exception. For example, lever tapware is designed to be easier to turn than traditional cross tapware, and many Caroma taps can be pre-set to control water temperature in order to reduce the risk of scalding. A wall-hung basin is best for a care bathroom as it does not restrict floor space around the basin and makes the tapware more accessible. Alternatively, if you have a vanity, a semi-recessed basin is beneficial as it overhangs the vanity, allowing better access to the tapware. Showers on rails offer the most flexibility for a care bathroom. The height of the rail shower can be adjusted to suit the person using the shower, or removed to use as a hand piece for easy showering. Grab rails are a great asset in a care bathroom to assist those requiring a little extra support. The stainless-steel finish provides a slip-resistant surface for enhanced stability and safety. Shower seats are designed to make showering easier and more comfortable. Ensure you buy a quality shower seat that is purpose-built to comply with Australian standards. The Virtu Comfort Shower Seat is one of the newest to market, complying with the AS1428.1 standard.